On the instructions of the executor: a detached, individual and particularly well proportioned 3, possibly 4, bedroom bungalow, occupying a good sized corner plot, with double garage and ample additional off-road parking, close to the centre of this extremely well served and highly sought-after creekside village, just 4 miles from the port of Falmouth and 8 miles from the cathedral city of Truro. 'The Braighe' is a detached individual bungalow which, we understand, was constructed approximately thirty years ago, and is now to be sold with immediate vacant possession on instruction of the executor. Standing in surrounding and mainly level gardens which are well enclosed to all sides, the property benefits not only from an attached double garage, but also of ample forecourt parking, sufficient for several vehicles, and ideal therefore for those with a caravan or boat etc. The sealed unit and oil fired centrally heated accommodation is particularly well proportioned and, in brief, comprises an entrance hall which opens into an inner/bedroom hall, 19'5 double aspect lounge with open fireplace, separate dining room or possible fourth bedroom, kitchen, separate utility room, master bedroom with en-suite shower room, two further double bedrooms, and spacious family bathroom. 'The Braighe' is situated close to the foot of Bells Hill, adjacent to the church, with the village's excellent day-to-day amenities just a few minutes' walk away, including junior schooling, hairdressers, newsagents, dentist, public house, convenience store, butchers, active community hall, doctors surgery, fishmongers and post office. There are many pretty walks in the area, particularly along the banks of Mylor Creek, to Restronguet Passage and the Pandora Inn in one direction, and Mylor Harbour and the sailing waters of the Fal Estuary in the other. With the port of Falmouth and cathedral city of Truro just four and eight miles distant respectively, it is easy to understand why the village is so popular with so many prospective purchasers and, therefore, we, as the vendor's Sole Agent, strongly recommend all interested prospective purchasers arrange an early viewing appointment. Radiator, telephone point, doors to the reception rooms and opening into the inner hall (see below). An extremely well proportioned, double aspect room, with sealed unit double glazed windows to the front and side elevations. Two double radiators, open fireplace with raised hearth and timber mantel, TV aerial socket. 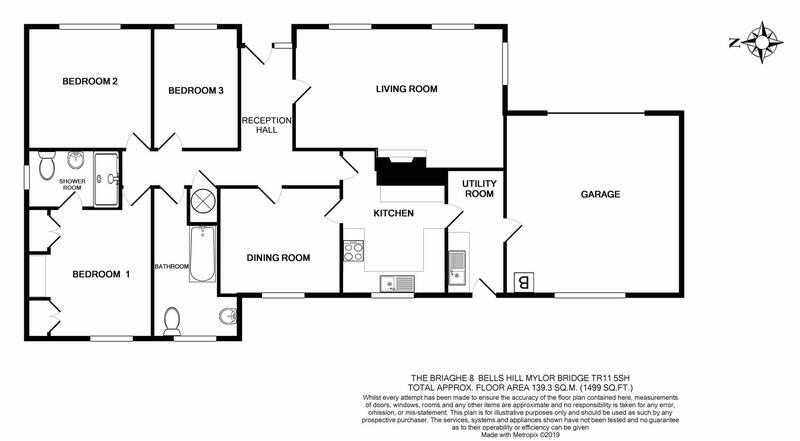 An extremely versatile room, interconnecting with the kitchen, suitable alternatively as a fourth bedroom if required. Sealed unit double glazed window to the rear elevation, radiator. Courtesy door to the garage, radiator, fitted work bench with inset stainless steel sink unit with cupboard below and space with plumbing for washing machine. Sealed unit double glazed door to the rear gardens. Access to extensive over-head loft storage area. Built-in airing cupboard housing foam lagged copper cylinder with immersion heater and timer switching. Fully ceramic tiled walls, low flush WC, pedestal wash hand basin and broad walk-in shower cubicle with Mira instant shower. Obscure sealed unit double glazed window to the side elevation, extractor fan, radiator, strip light/shaver socket. Broad sealed unit double glazed window to the front elevation, radiator. Sealed unit double glazed window to the front elevation, radiator, TV aerial lead. A spacious bathroom with three-piece suite comprising a panelled bath with hand grips and mixer tap with shower attachment, low flush WC, pedestal wash hand basin. Part tiled walls, strip light/shaver socket, radiator, extractor fan, obscure sealed unit double glazed window to the rear elevation. 'The Braighe' benefits from an extensive parking area to the front and side of the property, mainly tarmaced, providing off-road space for several vehicles and ideal, therefore, for those with caravans and boats etc. Double timber gates from the roadside. Courtesy light and exterior water tap. Metal up-and-over door, light and power connected, sealed unit double glazed window to the rear elevation, Myson oil fired boiler providing domestic hot water and central heating. Electrical consumer unit, courtesy door to the accommodation. Paved pathway and terracing, exterior water tap, courtesy door to the accommodation, further area of level lawn bordered by mature shaped plants. Oil storage tank, further area of gravelled hardstanding. Mains electricity, water and drainage are connected to the property. Telephone points (subject to supplier's regulations). Oil fired central heating. Proceed into the village of Mylor Bridge from the direction of Falmouth, passing the convenience stores on the right-hand side. Shortly after The Lemon Arms, take the first turning left onto Comfort Road and, after a short distance, take the first turning right into Bells Hill. The property will then be found on the left-hand side within approximately 200 metres.